New parents are often showered with advice. One of the biggest pieces is this: Never wake a sleeping baby! On one hand, anyone can understand why this matters: babies need sleep to develop their bodies. Babies are a lot of work, and the moments when they are asleep allow you to get other things done in the house. On the other hand, is all that advice right about just letting them sleep as long as they want? Here’s the answer. When Should You Wake a Sleeping Baby? Though you might think it’s crazy to wake a sleeping baby, there are actually times when it makes sense to get the baby up. Here are the biggest ones. Newborn babies need to eat every three hours or so. During those first few weeks of life, it is very important to continue feeding your baby every three hours so that they can gain weight and stay healthy. After that, your pediatrician might be okay with allowing the baby to sleep for several hours between feedings. Sometimes newborns get their nights and days completely mixed up. This can spell some serious trouble for parents who really need their child to sleep at night. It is important to make sure that the days are packed with light and plenty of background noise, and that the nights are very quiet and dark. A baby who has confusion over night and day should be awoken during normal hours in order to reset their natural clock. Sometimes babies might sleep a very long time for one nap, and that means they won’t want to take the second nap at the scheduled time or they will be crankier closer to bedtime. Sometimes it will be necessary to wake sleeping babies in order to get them on the proper schedule and ensure they are in bed for the night by eight a.m. or so – this makes for a much easier morning! The baby needs to have about 10-12 hours of overnight sleep. Should you wake a sleeping baby from a nap? Yes. Wake your baby up under the following cases. The baby sleeps longer than 3 hours in a nap. The baby takes a nap longer than 2 ½ hours OR sleeps more than 4 ½ hours during the day. The baby sleeps longer than 2 hours for a nap OR has more than 4 hours of daytime sleep. 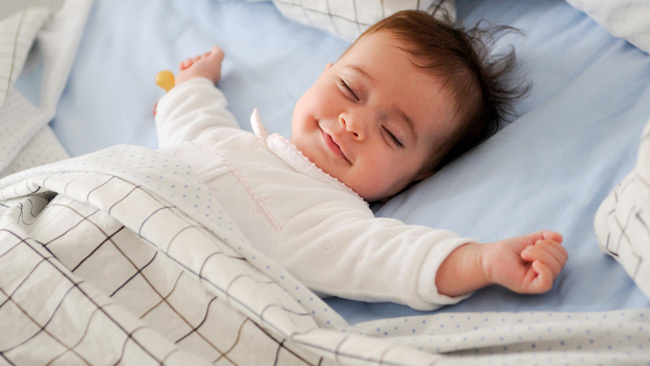 The baby naps for more than 2 hours at a time OR sleeps for more than 3 ½ hours in a day. The nap is longer than 2 hours OR the baby sleeps for more than 3 ¼ hours in a day. The nap is longer than 2 hours OR the baby sleeps for more than 3 hours in a day. The baby gets over 3 hours of sleep in a day. Now that the question “should you wake a sleeping baby?” has been answered, it’s time to learn the art of waking a child up without complaint or worry. These steps can help. Watch for REM sleep. A baby who is twitching, moving the eyes behind eyelids, changing facial expressions, and otherwise making slight movements is probably in REM sleep. This is the perfect time to wake a baby, as he/she is already just under the surface of consciousness. Lower the lights. Babies are sensitive to light, so make sure that the room is a bit darker when you wake the baby up. This will help avoid crankiness. Remove coverings. Take off the baby’s socks, remove bed coverings, and even start changing the diaper. This usually wakes babies up, especially if they are in a light sleep. Make contact. Look into your baby's eyes, talk quietly, rock him/her gently, sing, wipe his/her face with a damp cloth, and otherwise let your baby know of your presence. The sound of your voice will be interesting and will help keep him/her awake. Hold your baby skin to skin. Solid skin-to-skin contact will often wake a baby up peacefully. Hold your baby up in a sitting position, being sure to support the back and neck while you coo to him/her. Gently massage. Massaging your baby can stimulate limbs and wake him/her up. Foot massages are great, as are head massages. When should you wake a sleeping baby? This is pretty clear now. But what about the times you should just let your baby sleep? Sometimes a baby is simply easy to handle, and he/she will take great naps while still sleeping for a solid ten hours at night. If you have a baby like this, congratulations! Just be sure to keep a sleep log anyway, so you can tell if your baby begins to sleep too much. Another time to leave a baby alone is the time of sickness. A baby who is fighting a cold, flu, infection or anything else will need ample sleep to allow the immune system to work properly. You want to keep your baby comfortable and well-rested. If your baby wants to sleep a lot while sick, it’s certainly okay.